Architectural rendering of the revitalized Connecticut State Pier in New London. Connecticut Governor Dannel Malloy says the state will invest $15 million into the Connecticut State Pier in New London. Malloy says the money, which must be approved by the State Bond Commission on Friday, would help spur economic development that could turn the city into a hub for the offshore wind industry. “This investment will position New London and southeastern Connecticut to be a major hub and crucial staging location for the burgeoning offshore wind industry, to put us in a position to capture benefits from that industry,” Malloy said. There are currently seven offshore wind projects planned in the Northeast, including off of Rhode Island, Massachusetts, New York and New Jersey. Malloy said New London could be used to deploy equipment and workers for those projects. 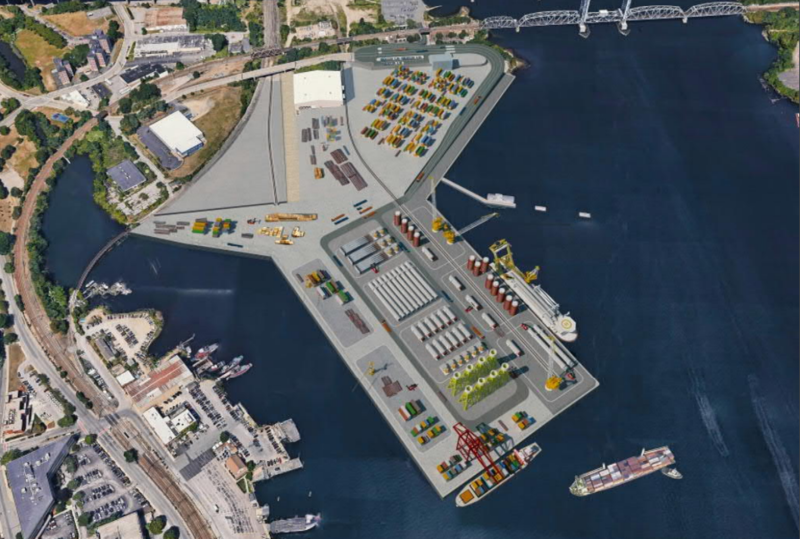 He said the city has a lot of advantages over other sites, including a well-protected harbor and an existing maritime industry buoyed by companies like Electric Boat. The money will pay for demolition of some existing structures and the building of some new ones, including a heavy lift pad. State officials say the development will also provide a better link from Long Island Sound to the region's freight rail system.